Some may refer to her as the “little red dot”, but Singapore’s presence in the world today is larger than that moniker. In fact, Singapore is a bustling cosmopolitan city that offers a world class living environment, with her landscape populated by high-rise buildings and gardens. One interesting facet you’ll discover about Singapore is a ubiquitous collage of cultures, where people of different ethnicities and beliefs coexist. Singapore has a mild tropical climate with abundant rainfall throughout the year with an average temperature of 28 degress Celsius. Dress code is generally informal but formal wear will be required at some places or occasions. Singapore’s voltage is 220-240AC, 50 Hertz. Most hotels can provide a transformer to convert it to 110-120AC, 60 Hertz. The World Competitiveness Yearbook (WCY) identified Singapore as the most politically stable country in Asia. In research done by Mercer Human Resource Consulting in 2003, Singapore was ranked second in personal safety among the world’s top 50 cities. Major credit cards and charge chards such as American Express, Diners , MasterCard and Visa are acceptable at most establishments. The currency is the Singapore Dollar (SGD). Banks and exchange bureaus are located in major shopping centres and airports to facilitate currency exchange. Smoking is not permitted in public service vehicles, museums, libraries, lifts, theatres, cinemas, air-conditioned restaurants, non-air-conditioned eating houses, hawker centres, hair salon, supermarkets, department stores and government offices. In line with efforts to improve the nightlife experience for all, there are smoking restrictions on entertainment outlets. Smoking is no longer permitted in pubs, discos, karaoke bars and nightspots, unless within approved smoking rooms or smoking corners. Offenders can be fined up to SGD1,000.00. Singapore Time is 8 hours ahead of GMT. Be it the bus, Mass Rapid Transit (MRT) or taxi cabs, getting around Singapore is a breeze. Clean and efficient, the Mass Rapid Transit (MRT) is a fast and popular mode of public transport to get around Singapore! Do note that some of the train lines (shown by dotted lines) are still in construction, so be careful when planning your journey! 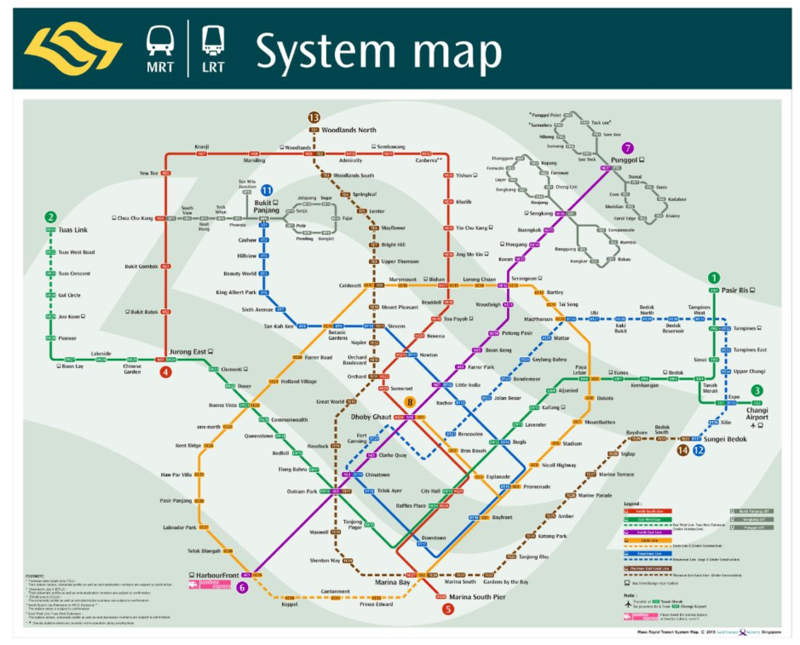 With the continual addition of railway lines, Singapore’s Mass Rapid Transit system is dynamic and ever-improving! Clean and efficient, this mode of travel is undoubtedly one of the more popular ones in Singapore! A leading bus and rail operator in Singapore, SBS Transit carries more than three million passengers and has over 200 bus services to many parts of the island! Click here for more details on catching buses in Singapore. It even includes a journey planner which helps you to plan your route!